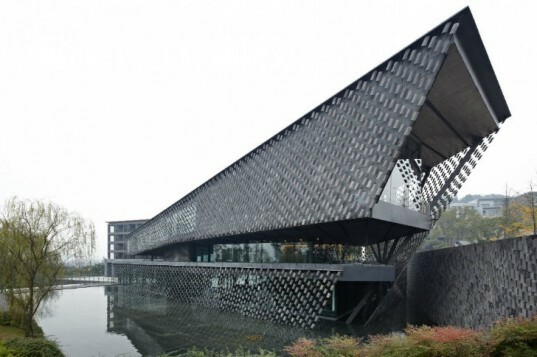 The Xinjin Zhi Museum is located near the entrance to a holy Taoist site in Chengdu, China and boasts a perforated facade that is both pretty and practical. Completed at the end of 2011, the museum was designed by Kengo Kuma and Associates and is a Taoist expression of nature & balance. The museum's flow is arranged in a spiral, allowing visitors to move through the space as if walking through a garden. The exterior is covered in a screen of tiles hung on wire that works to minimize direct light inside the museum and create harmony between light and dark. The Xinjin Zhi Museum is located at the foot of Laojunshan mountain in Xinjin and serves to usher people to the holy place of Taoism. Dedicated to the religion of Taoism, the design of the museum shows the essence of Taoism through its space and exhibitions. Visitors move from front to the back, and from motion to stillness, and the space is laid out like a planned spiral, moving from darkness to light. At the top of the museum, visitors can enjoy views of Laoujunshan mountain. The museum was constructed using local materials and worked on using methods traditional to the region in order to pay tribute to Taoism. The exterior is covered with a tile screen hung and floated in the air with wire, giving the feeling of lightness. Each facade is treated differently depending on the surroundings and the solar access. The tiles also serve to block direct sunlight into the museum and shade the interior from glare. In this way harmony between light and darkness is achieved and the interior enjoys a gentle light with beautiful particle-like shade. The Xinjin Zhi Museum is located at the foot of Laojunshan mountain in Xinjin and serves to usher people to the holy place of Taoism. 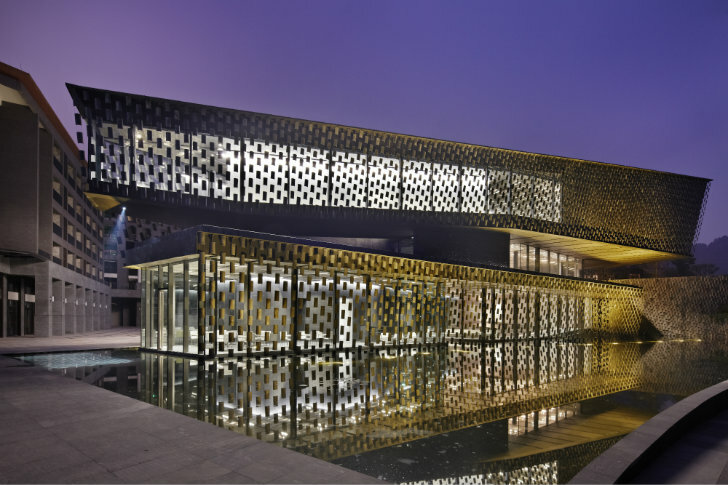 Dedicated to the religion of Taoism, the design of the museum shows the essence of Taoism through its space and exhibitions. Visitors move from front to the back, and from motion to stillness, like a stroll in a garden and the space is laid out like a planned spiral, moving from darkness to light. At the top of the museum, visitors can enjoy views of Laoujunshan mountain. The museum was constructed using local materials and worked on in a traditional method of the region, to pay tribute to Taoism that emphasizes on nature and balance. The exterior is covered with a tile screen hung and floated in the air with wire that gives the feeling of lightness. Each facade is treated differently depending on the surroundings and the solar access. The tiles also serve to block direct sunlight into the museum and shade the interior from glare. In this way harmony between light and darkness is achieved and the interior enjoys a gentle light with beautiful particle-like shade. The interior is a delicate balance. Elevations of the Xinjin Zhi Museum. Cross sections of the Xinjin Zhi Museum.